If you are going to buy a Canon EOS DSLR camera for the first time, then we recommend you to go for the Canon EOS 1300D which is not just easy to use but also brings all the fun into your photography. 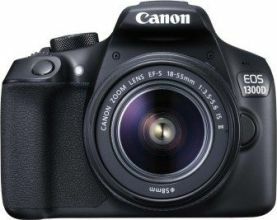 It is an entry level DSLR which has inbuilt Wi-Fi facility. Canon EOS 1300D works fine with over 70 EF/EF-S lenses and includes ample of shooting features which let a beginner to shoot like a pro. It equips a high-quality sensor and processor that produce excellent images. It offers various shooting modes and powerful lens to enhance your capabilities. Let's have a look at the key features of this camera and find out what stands it apart from the crowd. The EOS 1300D offers 18 megapixels APS-C CMOS sensor which along with DIGIC 4+ image processor provides high-quality images with excellent tonal gradation and perfect colour saturation. The advance sensor provides sharp focus and works exceptionally well on the high ISO range. It captures detailed images with less noise in the dark environment. The sensor size is around 22.3mm x 14.9mm. Dimensions of the EOS 1300D are 129.6x99.7x77.9mm, and it weighs around 480 g which sounds a bit heavy, but when you hold it in hands, it feels light. The camera includes HDMI mini output and comes with Built-in flash. It supports the storage via SD card, SDHC card and SDXC card. The camera packs Bright optical viewfinder which provides coverage of approximately 95%. Viewfinder Shooting provides a perfect view of the frame and enables fast and accurate focus while holding the camera. The camera also offers 3 inch LCD touchscreen display with almost 920k dots and offers Live View mode. The Live View mode lets users see the result before taking the image and check the focus. The camera has all the buttons on the right side of the LCD screen. The camera is easy to function, and users can shoot HD videos with a single click and adjust the recording level manually. However, there is no button to access the video mode directly, and users need to switch the mode dial into recording mode. The EOS 1300D comes with five creative filters that allow users to show their creativity and give a totally new look to the final picture. The camera includes a Basic+ features which allow user to choose from several modes like cool, soft, warm, vivid, monochrome, etc., and shoots automatically to deliver desired results. EOS 1300D packs EF-S18-55mm IS II lens kit along with the double zoom kit lens (EF-S18-55mm IS II and EF-S55-250mm IS II), to provide smooth operation and improved optics for magnificent results in still images and videos. The camera offers a focal length of 18–55 mm. The camera supports NFC which helps you to control the device with your mobile. The Camera Connect App is compatible with both iOS and Android which, along with the Remote Shooting feature allows users to capture beautiful shots and zoom into the subject from their smartphones. The Camera also equips in-built Wi-Fi, which lets you share your images and videos on social networks with a single tap on the touch screen. Users can save images and videos directly from the camera into the memory card. You can easily capture a crucial movement, even if the subject is moving so fast due to the exceptionally high-speed continuous shooting at impressive 3 frames per second. After taking the shot, you can choose the best one from multiple images. The EOS 1300D offers 9 point auto-focus with 1 centre point auto-focus which helps users to focus on the subject with more accuracy regardless their position and takes clear images. The facility is highly useful in landscape and portrait pictures. The Camera offers high sensitivity ISO range from 100 to 6400 during still shooting, which is expandable up to 12,800 during video shooting. Users can use a fast shutter speed to capture detailed images in low light conditions. The EOS 1300D comes with an LP-E10 battery pack which last for 3-4 hours LC-E10E Battery Charger. The battery last up to 500 shots using the Viewfinder and 180 shots while using the Live View.